When I tell people about Burning Man, I usually get one of two responses. People either say, "I want to go!" ...or they say, "What's Burning Man?" They either seem excited about the idea of going, or think I'm absolutely insane to spend a week in the desert. It's certainly not for everybody. Burning Man means different things to different people. To look at it one way, it is a week of music, dancing, art, camping, and overwhelming sensations with thousands of wildly creative people, held in one of the most remote, inhospitable places on Earth. It is a truly unique experience. 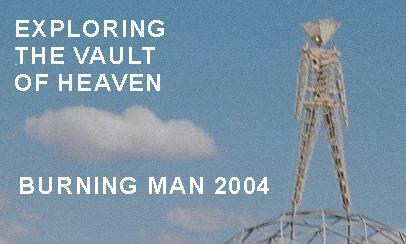 The art theme for 2004 was "The Vault of Heaven," reflecting the human view of the universe and our quest for understanding. Where does everything come from? Where does everything go? And where and how, in this vast scheme of things, do we fit in? I started planning for Burning Man 2004 almost as soon as I got home from the 2003 burn. One advantage was that I'd already invested in most of the stuff I'd need, so that meant I didn't have that much to get for the following year. Clothes, sleeping bag, tarps, flashlight, equipment-- they were all packed away, ready to be used again. I had a whole year to get ready. I financed the trip by putting a little away every month. A few bucks here, a few bucks there-- it adds up. I also knew what extra equipment I was going to need for my trip, so I picked stuff up whenever a bargain presented itself. Burning Man is a gifting community, so over the course of the year I collected a bunch of red bandanna handkerchifs for Tapestry (me) to give away to people. On my first trip to Burning Man, I just wanted to get there and back. I wasn't even there for the whole event. I wanted my next trip to the playa to be different. For one thing, I was going to leave early enough to experience the whole week-long event. Time was on my side. My first trip, I had used lots of interstate highways to make good time. The problem was, you can't really see the world from the interstate. All the really interesting places seemed to be off the beaten path. I wanted to take some time to see some of those places. For one thing, I had never seen the Pacific Ocean. I'd never even been to California before. (Okay, my parents took me there on a trip when I was six months old, but if I can't remember it, I don't think that counts.) Just a couple of months before, I had dipped my toes into the Atlantic Ocean, so I knew I had to somehow squeeze the Pacific into my trip. I got out maps and started looking at what I wanted to do in 2004. I love to go down roads I've never been before, to blaze new trails, see new sights... There was a lot of country between where I was and where I wanted to go, and lots of things to see along the way. I didn't want to rush things.